Do I Really Need An Attorney For My DUI? Private Attorney Better Than Public Defender? Hiring a St. Petersburg / Clearwater Criminal Defense Lawyer Looking for an affordable attorney? The consultation with our lawyers is free and we offer payment plans. Click here for more information on our legal fees. Because of the negative image popularized in the movies and on television, the public defender is often portrayed as an inadequate and ineffective legal counsel. Such a characterization as a “second class attorney” or “lawyer of last resort” is clearly unwarranted. The truth is that most public defenders are dedicated lawyers who genuinely care about their clients. Despite the fact that public defenders have received a bad rap in the entertainment media, the Public Defender’s Office must deal with several limitations that experienced private criminal defense firms typically do not have to contend with. For example: 1.) 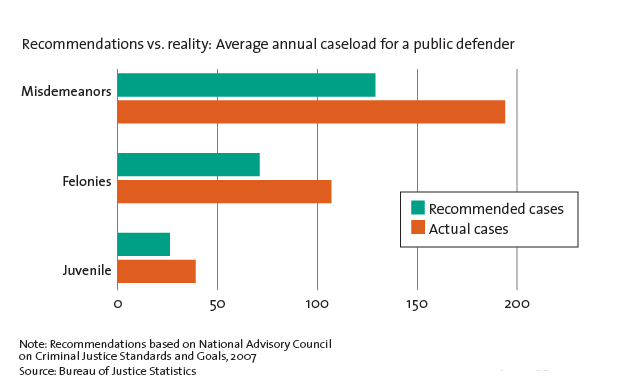 Public defenders typically carry an enormous case load and can therefore only dedicate so much time to each client. Consequently, our clients often complain to us that they lacked significant contact with their appointed counsel outside of court appearances. 2.) The Florida Supreme Court has openly acknowledged that the public defenders system in Florida is chronically under-funded. 3.) By law, public defenders can only represent you in your criminal case. They are prohibited from helping you with related civil or administrative matters such as a driver license suspension hearing. 4.) In most situations, you are required to work with the particular public defender who has been appointed to your case. With a private attorney, you have the ability to interview several attorneys and choose the paid lawyer that you feel most comfortable with. We can intervene early on your behalf by providing the prosecutor with your side of the story in an effort to persuade the Pinellas County State Attorney’s Office not to file formal charges. Because we control the number of cases we take on, we can devote all the necessary attention that your case demands. We are always available to provide counsel you, even after the conclusion of your case. Our resources are not tied to the legislature’s current budget cutbacks and are therefore available to fully investigate the facts of your case. We are former Florida State Prosecutors who have insight and experience in understanding the strengths and weaknesses of our adversary. We will help you with your civil or administrative matters such as attending necessary DHSMV hearings regarding your suspended / revoked driver’s license or representing you in connection with a civil injunction or restraining order. Some Additional Points to Consider Regarding Representation by a Public Defender Not just anyone is entitled to the appointment of a public defender. In fact, the Public Defender’s Office can only represent someone when two conditions are satisfied. 1.) The person is facing jail or prison as a possible sentence in a criminal traffic, misdemeanor, or felony case; and 2.) The judge must find that the defendant is “indigent,” under Florida Statute ss. 27.52 or financially unable to afford a private attorney. Should I Stay with the Public Defender? Not all applicants qualify for a public defender. Those people found to be indigent (and entitled to appointed counsel) soon realize that the services of a public defender are not free. If you plead guilty, no contest, or are later convicted after trial, the court will often order you to pay attorney fees as part of your sentence. This practice is employed to reimburse the public for the services of your appointed counsel. If you attempt to seek the appointment of a public defender, you must first submit an application to the clerk of the court demonstrating your inability to pay for a private attorney. The application includes details of your financial situation including income, assets, liabilities, the amount of bail posted, and other pertinent information. Additionally, all applicants must pay a non-refundable $50.00 application fee. Click here to view the Pinellas County Application for Criminal Indigent Status. After filing your application, the clerk of the court will review your information to determine whether you are indigent and therefore qualify for the aid of a public defender. An applicant is considered indigent if his income is equal to or below 200 percent of the poverty guidelines or if he is receiving Temporary Assistance for Needy Families-Cash Assistance, poverty-related veteran’s benefits, or Supplemental Security Income. However, if you own or have equity in any intangible or tangible personal or real property having a net equity value greater than or equal to $2,500, you do not qualify to have a public defender appointed. You need the advice of a qualified St. Petersburg / Clearwater criminal defense attorney. Call our office for a free consultation at (727) 578-0303. ©2017 Russo, Pelletier & Sullivan, P.A. All Rights Reserved. The hiring of a lawyer is an important decision that should not be based solely upon advertisements. Before you decide, ask us to send you free written information about our qualifications and experience. This web site provides general information only since the facts and circumstances of your case are unique. The information presented on this website is not to be interpreted as formal legal advice nor does it constitute the formation of an attorney/client relationship.